The painted sideboard is sporting my favorite color combination. I’m not sure which is the proper furniture term for this piece. It could be a buffet. Yeah, she’s flashy, splashy, sassy, and a little classy. She makes me smile. She makes my customers smile. That’s the highest compliment I can get. She doesn’t photograph well. I know it’s me. I’ve said before, I’m not a photographer. But, it always seems that my favorite furniture makeovers are the least photogenic. Makes me crazy! These pieces are hard to find….at least at a price I want to pay. I would paint furniture like this everyday if I could. The shape is perfect and what about those legs. I’m a leg girl! Aqua blue as basecoat and my favorite citrusy green as the topcoat. 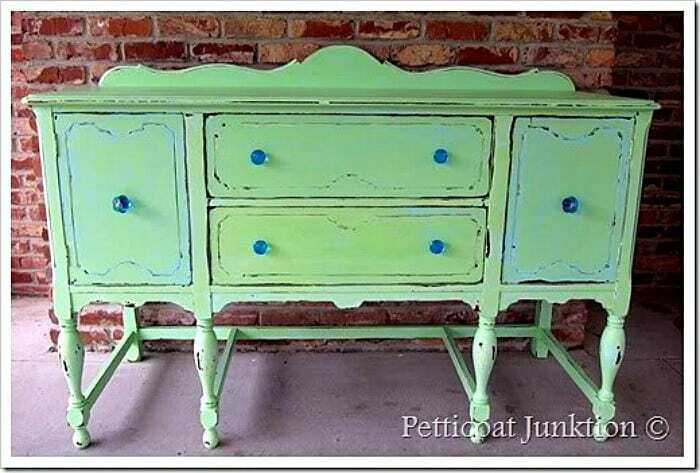 I called this makeover the turquoise and green painted sideboard buffet server. I’m not sure which furniture description is the best so I went with all three! knobs from Hobby Lobby..I love Hobby Lobby knobs because they are almost always on sale for half price. Can’t beat the price. I took her to the shop Friday and Sara suggested we leave her on the dock at the front entrance to You Never Know. Lots of people came by and paid her compliments. Jennifer snapped her up before lunchtime. She made Jennifer smile too. Do you like the color combo. I love green and blue together…all shades. it’s beautiful, just wondering…did you prime first? I LOVE this piece!!! I think it is cheerful and sweet!! This is such a great piece. I like the aqua with the green! You did a fantastic job–again! I know what you mean about taking pictures:) Thank you so much for linking this up to Rustic Restorations Weekend! So pretty!!! Love the blue/green it looks GREAT!!! Love this green piece. I look forward to your new work. What a fun color! And I love the knobs!! I love everything about this! Now following you. i'm visiting via at the picket fence's friday party. what a great spring green that is! how is it that those colors we often think are too bright to use cheer up our spirits just the same. it cheered my heart to see this “splashy” sideboard. FANTASTIC choice of knobs. 🙂 perfection. thank you for sharing! I am in love with that color combination. LOVE IT. WHAT A STATEMENT THAT WILL MAKE IN ANY ROOM. It turned out great! I'd love for you to add it on my link party at: http://printabelle.com/?p=3188 Thanks! what a happy project! of course, she sold!! I absolutely love what you did with this project! Great colors and knobs! I am your newest follower! Love love love it! My fave colors too! Nice job. now if that doesn't make you smile, then i don't know what will! what a happy happy piece! Pretty colours! I like the turquoise knobs very much. Thanks for sharing this project. Hi Kathy, I am so glad you found me!!! I LOVE your blog!! The Blue desk on FB with the chair on top of it, well that same chair was in my cart at Goodwil today!! and I put it back!!!GRRR! Oh well…junkers remorse, lol! 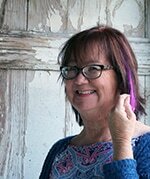 Hope to see you at the hope again tomorrow & also on Thursday for my Linky Party! 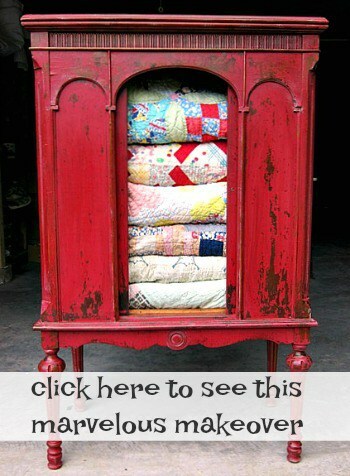 Come by and link up some of these gorgeous upcycles of yours!